External apps (also commonly called external tools or LTI tools) are tools and utilities, usually from a third party, that integrate seamlessly with Canvas by virtue of their conformance with an open standard called Learning Tools Interoperability (LTI). Apps make it possible to extend, augment, or replace Canvas's core capabilities with additional or alternative features. 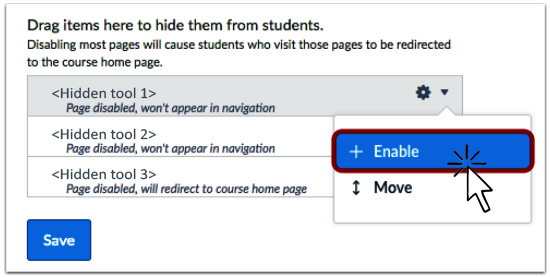 In Canvas, navigate to the desired course. On the course "Settings" screen, click Apps. On the Apps tab, click View App Configurations. On the "External Apps" screen, you'll see all the apps installed in your course. Apps with a lock icon to the left of their name were added by an administrator at the university, campus, school, or department level and cannot be modified or removed. Apps with the settings (gear) drop-down menu on the right were added by a teacher or equivalent role within the current course. They can be modified or removed as needed. Whitelisted apps are apps that have been pre-approved for integration into Canvas courses at IU, but have not yet been installed. If an app that is not installed in your course already appears in the Canvas App Center, it has been whitelisted, and you may add it at any time. To add a whitelisted external app, follow the instructions in How do I use the Canvas App Center in a course? from the Canvas Help Center. Apps that are not whitelisted in the App Center must be vetted to ensure they do not present a security risk to the faculty and students who use them. The approval process for integrating a non-whitelisted external app in Canvas can take several months, and involves getting proper contractual agreements, a UISO security review, and approval from university Data Stewards. External apps that replicate services offered by other tools integrated in Canvas will likely not be approved. Submitting your Canvas integration request for a non-whitelisted external app by or before the dates above does not guarantee approval. If you don't see information below about submitting a request for an external app at IU, log into the Knowledge Base near the top of this page. If prompted, authenticate with your IU username and passphrase. Some pre-installed apps are visible by default, while others are hidden by default. Apps that you install yourself may appear immediately; others need to be manually enabled or inserted by the instructor. Also, external apps can be used in many places in Canvas. Where and how the app can be used depends on the nature of the app itself. For example, many of the whitelisted apps (e.g., YouTube, Wikipedia, and LTI Maps) are designed to allow you to insert content from an external source into the rich text editor. Apps like Turnitin are used primarily for accepting, processing, and/or grading student work and are exposed in Canvas assignments. See below for general guidance on how to expose or enable external apps in Canvas by tool location. The best way to find out where an app is intended to be used is to read the documentation for the app. Course navigation menu: Some external apps are visible in the course navigation by default, but many are hidden. Modules: External app module items are usually added manually by the instructor. To add an external app as a module item, see How do I add an external tool as a module item? Assignments: External app assignments are usually added manually by the instructor. To create an external app assignment, see How do I add an assignment using an external app? Rich-content editor: External apps designed to work with the Canvas rich content editor show up as a button in the editor toolbar as soon as they are installed. This is document bfjs in the Knowledge Base. Last modified on 2018-11-28 11:55:57.